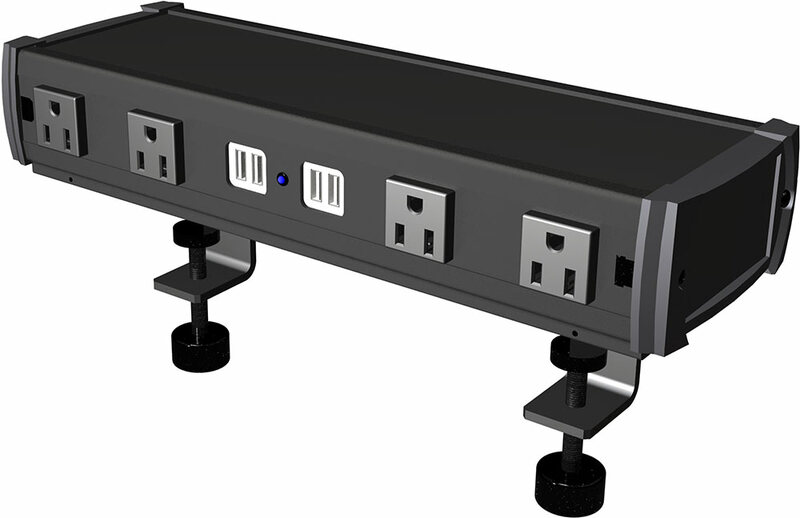 Motion Labs manufactures a low profile desk mount power distribution unit designed to provide laptop power and a USB charging station for conference or meeting room environments. These units are equipped with a slide in desk mount dual clamp assembly as well as a slip free surface for free standing applications. They can be strung together or used separately. USB lamps can be plugged in to provide illumination. These units are available with a large variety of personalization, including color options and wood finishes for the top plate as well as logos or corporate information. Built under the UL60950 standard for both Canadian (C) and United States (US) listings. Power your conference room with confidence using the most trusted name in portable power distribution.